Bring dawn all ingredients and reach 100000 points to complete the level. This level is hard as it have lot of chocolate machine and you need to take down 10 ingredients. You should first break all chocolates and play near to any chocolate machine unless you have chance to make special candy anywhere or need to take down ingredients. You should play till last moves as you could chance get chance any time to reach requirement. 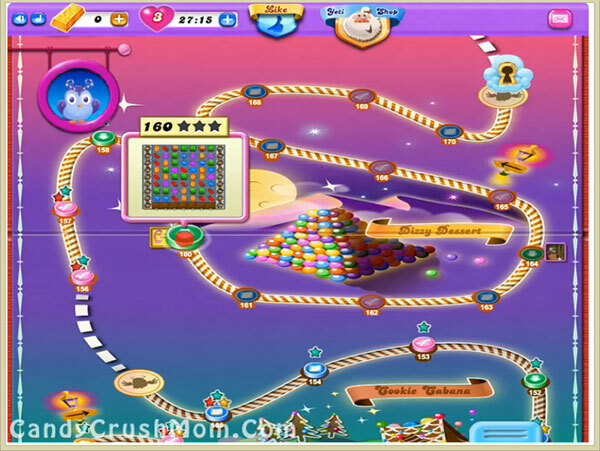 We completed this level with 164960 score by playing near to chocolate machine and use special candies plus moon stuck help to take down all ingredients to bottom with three star score at the end.